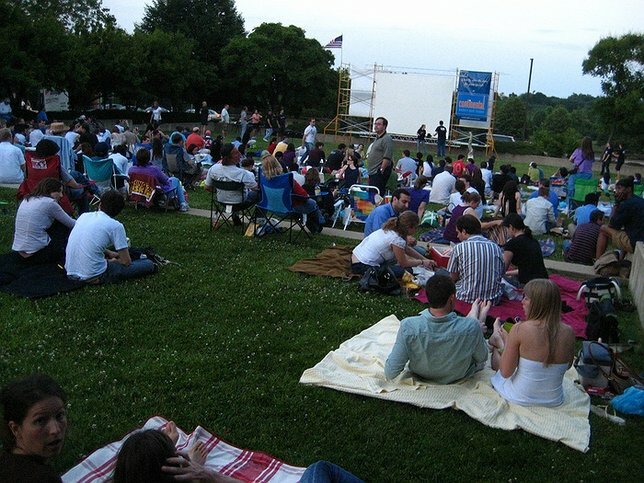 Enjoy the great outdoors, along with a film, during an outdoor movie screening on L.I! When it comes to spending time outside, there’s no time quite like a summer night. With the day finally cooled down, yet still comfortable, the chorus of grasshoppers and other nature sounds surrounding you, there really is no finer time to get up and get out into the great outdoors. For movie enthusiasts who’d rather be watching a film than watching the sights and listening to the natural sounds around them, Long Island has the perfect activity for you - outdoor movie nights! By participating in an outdoor film screening you get to enjoy the best of both worlds, the indoor and outdoor world! All you need to do is bring a blanket or a lawn chair, then sit back, relax and enjoy the show. Don’t forget to keep checking back as we will be adding more outdoor Long Island movie showings as they are announced! Enjoy an outdoor movie screening, at no cost, on the front lawn of South Bay Bible Church. Movies will be shown rain or shine! Watch Star Wars the Force Awakens, and eat free popcorn, on a huge outdoor 24 foot screen! Before the movie starts enjoy trivia and dj entertainment! The film starts at 8:55 PM. Head over to Eisenhower Park to watch the Secret Life of Pets on the giant screen at the Harry Chapin Lakeside Theatre! Bring the family out to enjoy a screening of The Secret Life of Pets. The film begins at dusk. Make your way over to Cedar Creek Park this summer to view The Good Dinosaur. Take in a free movie screening of Monsters, Inc. at Reverend Mackey Park! Head over to Eisenhower Park to watch Storks on the giant screen at the Harry Chapin Lakeside Theatre! Come out and see an outdoor movie showing of Monsters University at North Woodmere Park. Bring the family out to enjoy a screening of Sing. The film begins at dusk. Head over to Eisenhower Park to watch Lego Batman on the giant screen at the Harry Chapin Lakeside Theatre! Bring along a blanket or a lawn chair and settle in for a free outdoor film showing of Toy Story. Make your way over to Cedar Creek Park this summer to view Toy Story 2. Bring a lawn chair, or a blanket, and sit under the stars as you enjoy a showing of the movie Trolls. Gates open at 6 PM. Head over to Eisenhower Park to watch Trolls on the giant screen at the Harry Chapin Lakeside Theatre! Bring along a blanket or a lawn chair and settle in for a free outdoor film showing of Toy Story 3. Come out and see an outdoor movie showing of The Lego Movie at North Woodmere Park. Bring the family out to enjoy a screening of The Lego Batman Movie. The film begins at dusk. Head over to Eisenhower Park to watch Middle School on the giant screen at the Harry Chapin Lakeside Theatre! Bring along a blanket or a lawn chair and settle in for a free outdoor film showing of Hotel Transylvania. From 5 PM - 8 PM enjoy fun kids activities, like face painting, then sit down to a family friendly film in the mall's Lifestyle Village! Make your way over to Cedar Creek Park this summer to view Goosebumps. Head over to Eisenhower Park to watch Angry Birds on the giant screen at the Harry Chapin Lakeside Theatre! Bring along a blanket or a lawn chair and settle in for a free outdoor film showing of Hotel Transylvania 2. Come out and see an outdoor movie showing of Zootopia at North Woodmere Park. Take in a free movie screening of Teenage Mutant Ninja Turtles at Reverend Mackey Park! Head over to Eisenhower Park to watch Sing on the giant screen at the Harry Chapin Lakeside Theatre! Bring along a blanket or a lawn chair and settle in for a free outdoor film showing of Megamind. Head over to Eisenhower Park to watch Fantastic Beasts on the giant screen at the Harry Chapin Lakeside Theatre! Bring along a blanket or a lawn chair and settle in for a free outdoor film showing of The Peanuts Movie. Subject: LongIsland.com - Your Name sent you Article details of "Summer Screenings: Outdoor Movie Showings on Long Island"